Breakthrough Sleep Research. There are several stages of sleep that people pass through in the course of a good restful night. In each stage our sleep gets deeper, our bodies get more relaxed, and our brainwave patterns slow down. The deepest and most rejuvenating levels of sleep are associated with delta brainwave patterns. Delta sleep is the most physically relaxed stage of sleep, and it is the time when the body recuperates and rebalances itself for the new days. Getting enough sleep, but more specifically enough delta sleep, is essential for healthy, productive living. Dr. Jeffrey Thompson’s breakthrough audio techniques, developed over 25 years of clinical research, are proven to increase levels of delta brainwave activity. He has helped thousands of people to achieve regular, restful, revitalizing sleep. 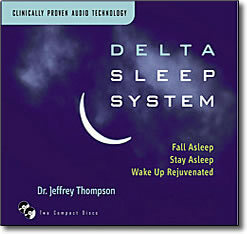 Play Delta Sleep System on any ordinary stereo or through headphones. Pulses of sound embedded into an ambient musical soundtrack, combining rich orchestration and 3D sounds of nature will coax your own brainwave toward their natural pattern of deep delta sleep.